For last year’s (2014) 150th anniversary commemoration of the Battle of Spotsylvania Court House, a colleague and I provided a tour that focused on the May 10, 1864 Union attack on the Confederate “Mule Shoe” defenses. We entitled the program “Upton Gets His Star: Revolutionizing Warfare,” a reference to Colonel Emory Upton, who we understood was promoted to the rank of brigadier general following the assault. A month later, while assisting with the Battle of Cold Harbor programs, a visitor who had been on the Spotsylvania tour asked me why the 2nd Connecticut Heavy Artillery’s monument at Cold Harbor listed Upton, the regiment’s brigade commander, as a colonel if he had been promoted two weeks earlier at Spotsylvania. I questioned Bob Krick, my friend and colleague at Richmond NBP, who informed me that when the monument was being planned in 2001 he could not find any indication that Upton held the rank of brigadier general at Cold Harbor. This interpretation ran contrary to the story we told, and had been telling for years, at Spotsylvania. If Bob was right, then when did Upton receive his promotion? 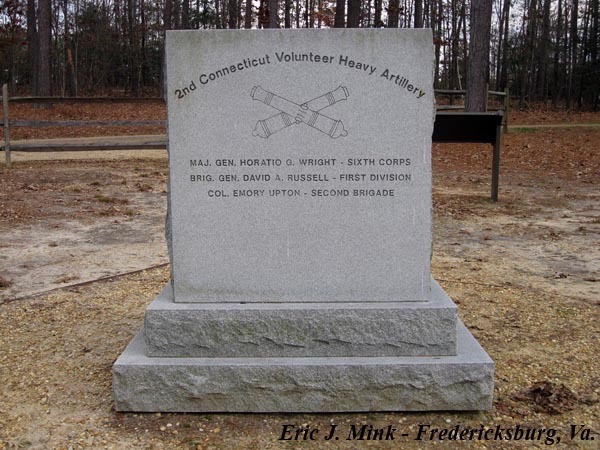 Monument to the 2nd Connecticut Heavy Artillery at Cold Harbor Battlefield. “Before leaving Washington I had been authorized to promote officers on the field for special acts of gallantry. By this authority I conferred the rank of brigadier-general upon Upton on the spot, and this act confirmed by the President.” Ulysses S. Grant, Personal Memoirs of U.S. Grant, Volume II (New York: Charles L. Webster & Co., 1885) 224-225. “’Upton you are to lead those men upon the enemy’s works this afternoon, and if you do not carry them you are not expected to come back, but if you carry them I am authorized to say that you will get your stars.’” Isaac O. Best, History of the 121st New York State Infantry (Chicago: W.S. Conley Co., 1921) 135-136. “’After he had gone I hunted up a pair of brigadier general’s shoulder straps, and wrapping them up carefully, put them in my pocket. I then went to General Wright and said to him, ‘General, you remember when Colonel Upton was selected to lead the charge it was the understanding that if he took the works he was to win his stars. Now I think he ought to have them. So with his permission, I telegraphed General Meade, asking if he would not request the commanding general to promote Colonel Upton to brigadier general. The general responded, ‘Certainly,’ and wired Washington that night and received a reply from the President, that his commission was made and signed. In the morning when I saw Upton, I said, ‘Upton, you remember when I told you that you were assigned to lead the charge, and if you did not you were not expected to come back?’ He replied, ‘Yes, I remember.’ ‘Well,’ said I, taking the stars from my pocket and unrolling the paper, ‘Here they are.’…He cut off his eagles and we got some thread and had the stars sewed on his shoulders, and he rode directly to his command to show them his preferment.” Isaac O. Best, History of the 121st New York State Infantry (Chicago: W.S. Conley Co., 1921) 138-139. This is a story that has been told and retold on the battlefield by countless historians and park interpreters and it is one that has repeatedly appeared in print. Dr. Stephen E. Ambrose, Upton’s biographer, recounted Best’s account of the promotion in his Upton and the Army (1964). Many authors writing about Upton’s May 10 attack conclude with Upton receiving a battlefield promotion. No mention of Upton’s battlefield promotion, however, appears in the published official records, dispatches or reports related to the Battle of Spotsylvania. To the contrary, Lieutenant Colonel McMahon wrote an order on May 18, 1864 referring to “Colonel Upton.” If Beckwith and Best are to be believed, why would McMahon, who claimed to be instrumental in securing Upton’s promotion, not refer to him in official correspondence by his new rank? Was Upton actually promoted in the hours following his May 10 attack? Furthermore, Beckwith and Best do not mention Grant as part of the chain to secure Upton’s promotion. Was Grant involved and did he have the ability to promote worthy officers on the field of battle? Promotion loomed large in Upton’s mind. There is no doubt he was an ambitious young officer. In letters to his sister, published in 1885 under the title The Life and Letters of Emory Upton and can be found here, he repeatedly complained of his perceived slow advancement. An 1861 graduate of the United States Military Academy, Upton served in the artillery early in the war, before reaching the rank of colonel and command of the 121st New York Infantry. On July 4, 1863 following the Battle of Gettysburg, Upton assumed command of the regiment’s parent brigade. This rise in position did not, however, come with a promotion in rank. For almost exactly a full year, Upton chaffed under the knowledge that he successfully managed and led his brigade in action, but the star of a brigadier general remained elusive. Upton did not lack for support in his pursuit of higher rank. Documents in his promotion file show that as early as September 1863 recommendations for an elevation to brigadier general arrived in Washington. Among Upton’s supporters were many of his fellow officers in the Sixth Corps, including Brigade Generals Joseph J. Bartlett, Albion P. Howe, Thomas H. Neill, Alfred T.A. Torbert, and Frank Wheaton. 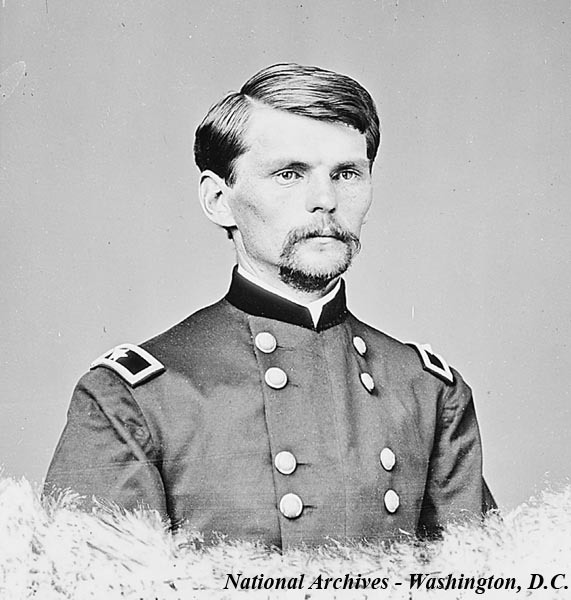 Following Upton’s performance at the Battle of Rappahannock Station in November, his immediate superior and division commander Brigadier General David Russell fired off a recommendation to the Secretary of War. Sixth Corps commander Major General John Sedgwick and army commander Major General George Meade endorsed these efforts to recognize Upton. Nothing resulted from them and on April 10, 1864, Upton wrote his sister that his “long-expected promotion is not forthcoming. General Meade has informed me that without ‘political’ influence I will never be promoted.” Politics played an important role in advancement within the army. Those officers with political connections could use them to affect appointments, while those without strong political backing, like Upton, might be passed over repeatedly. Whether Upton knew it or not, political support, of a sort, was indeed working his case. In mid-April 1864, a series of petitions on Upton’s behalf arrived at the War Department. Some of this support came from an unlikely location. Officials in Michigan, including forty-three members of the state legislature, urged the War Department to consider Upton’s promotion. The Michigan connection is likely due to Emory’s brother, James S. Upton, an influential businessman living in Battle Creek. Additional petitions arrived from officials in various towns in Upton’s native New York. From within the Army of the Potomac, petitions bearing the signatures of dozens of officers arrived from the 5th Maine Infantry within Upton’s own brigade, as well as various regiments of the First New Jersey Brigade. Likely due to this effort, on May 13, 1864 Acting Adjutant General of the United States Army Brigadier General Edward D. Townsend wrote the Secretary of War urging Upton be considered for promotion to the rank of brigadier general, when the opportunity presented itself to appoint an officer to that rank. Coincidentally, that same day, another recommendation for Upton’s promotion was penned, which came from the battlefield and likely tipped the scale in his favor. In a second post, found here, we look at the timeline of Emory Upton’s long awaited promotion to the rank of brigadier general. Much thanks to Brooks Simpson for answering some questions and providing thoughts on Grant’s memoirs and official correspondence. Also, thanks to Bob Krick and Beth Parnicza for allowing me to bounce my own thoughts and ideas off them. He did deserve it, having served in the capacity of a brigadier for almost a year. Part 2 will ask the question if the timing makes any difference in how we view the promotion and the attack on May 10, 1864. “History says there was no finer operation in the shape of a direct assault on strong works during the whole war. But like many other actions of the kind it was isolate and though in itself successful, its success was rendered useless by lack of concerted support. Somebody was to blame for the sacrifice of a thousand or so of the best troops in the army, and it don’t look like it was Gen’l Upton — he done his part and the men did theirs. — Civil War Memoir of Pvt. Calif Newton Drew, Co. K. 6th Maine Infantry, in the second line of attack at the Mule Shoe under Upton. Thank you Matt. I was unaware of Kidder’s writings. I’ll check them out. Part 2 of this post will look at the timeline of Upton’s promotion. I’m looking forward to it. Just a note, though– John Kidder was the subject of the book, not its author. James Greiner wrote it, based chiefly on Capt. Kidder’s letters home.